As a home buyer in New York City, you may have been asked by a listing agent to sign a ‘dual agency’ disclosure form. Agreeing to dual agency will cost you money because it means that you won’t be able to request a buyer agent commission rebate. Furthermore, dual agency presents you with several risks which we more fully explain below. What is dual agency in NYC? Dual agency in NYC real estate occurs when the same broker or salesperson simultaneously represents both the buyer and seller in the same transaction. Dual agency also occurs when both the listing agent and the buyer’s agent work for the same brokerage. It is also considered to be a dual agency situation if the same broker or salesperson represents two parties in a mutually dependent transaction. What are some examples of dual agency in NYC? Is dual agency in New York illegal? Why is dual agency risky for buyers and sellers? What are the cons of dual agency in NYC? What are the pros of dual agency in NYC? What are the dual agency disclosure requirements in New York City? What is Section 443 of the New York Real Property Law? John Smith at Brokerage A is currently marketing an exclusive listing in the West Village. Although 75% of the buyers who inquire on his listing are working with buyers’ agents, John does receive a handful of walk-in buyers who are unrepresented. If a walk-in buyer demonstrates an interest in the property and decides to submit an offer, the listing agent will be in a position to act as a dual agent for both buyer and seller. Dual agency also occurs in a situation where members of the same brokerage firm are representing both the buyer and seller. Even if the listing agent and the buyer’s agent have never spoken before and work in different offices, being associated with the same brokerage will trigger a dual agency environment. Going back to our previous example, John Smith at Brokerage A is holding an open house for his exclusive listing in the West Village. An unrepresented buyer who happens to live in the building pays a visit and expresses and interest in the listing. However, the buyer also mentions that he must first sell his current studio apartment before he is able to make a purchase. If the listing agent agrees to represent this buyer on his sale so that he can ultimately buy John’s listing, then these are considered as mutually dependent transactions. As such, this triggers a dual agency situation. Dual agency in New York is completely legal, however a real estate salesperson or broker is required to fulfill several disclosure requirements before being permitted to transact as a dual agent. New York’s dual agency disclosure requirements were made effective in on January 1, 2011 with the amendment of Section 443 of New York State Real Property Law. Dual agency is risky for buyers and sellers because it means that the salesperson or broker is no longer able to offer undivided loyalty to either party. Typically, hiring an agent to represent you signifies the establishment of a principal agent relationship which is fiduciary in nature. Under a dual agency arrangement, is no longer possible for the salesperson or broker to provide undivided loyalty to both parties at the same time. As such, the key motive for disclosure in a dual agency situation is to ensure that both buyer and seller understand that he or she is giving up the right to undivided loyalty. 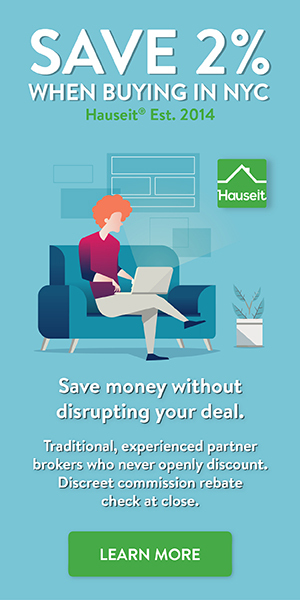 Agreeing to dual agency as a buyer will take away your ability to automatically save money on your purchase by requesting a NYC buyer agent commission rebate. In addition, there are a number of other risks you should be aware of if you are considering signing a dual agency disclosure form as a buyer. Requesting a buyer agent commission rebate in NYC is an automatic way to save $20,000 or more on your sale price. The savings you pocket from a commission rebate can fully offset the NYC mansion tax and reduce your closing costs. Rebates are effective in NYC because virtually all sellers have agreed to pay the same total average 6% NYC commission regardless of whether the buyer has a buyer’s agent. Therefore, electing to be ‘unrepresented’ will not make your offer more competitive in the eyes of the seller. By representing you on a purchase, your buyer’s agent will collect half of the total commission (paid by seller) which would otherwise have gone directly to the listing agent. When you request a rebate, your buyer’s agent will legally give you back a portion of the commission he/she earns in the form of a cash check at closing. Commission rebates are completely legal in NYC, however most buyers have never heard about of them. Why? Broker commission rebates save consumers money, and as a result virtually all brokers in the city either refuse to offer them, deny that they exist, or claim that they are illegal (note: false). As a matter of fact, broker commission rebates are encouraged by New York State’s Attorney General as a means of reducing broker fees and helping consumers. Better yet, commission rebates are not generally considered to be taxable by the IRS. Another key risk of agreeing to dual agency arises if you happen to be buying a co-op in NYC. Co-ops have a very rigorous board application process, and rejections are a common occurrence. If the listing agent is a risk taker, he or she may see you as a meal ticket for earning double commission on a deal even if you might not be the best fit for the co-op. With the double commission in mind, the listing agent may therefore be incentivized to try and sell you a co-op even if there would be less risk in choosing a more qualified buyer who is represented. Agreeing to dual agency in NYC can help streamline the purchase process by making it more efficient from a timing standpoint. By having just one agent on the deal, both the buyer and seller will be able to more easily coordinate showings, discuss pricing and prepare the board application (if you are buying a co-op or condo). As a buyer, you will have to consider whether or not the aforementioned benefits justify the fact that dual agency will prevent you from requesting a buyer agent commission rebate and having a real advocate throughout the deal. Regardless of what you decide to buy, you can automatically save money on your purchase by requesting a buyer agent commission rebate. The New York agency disclosure law compels agents to present the disclosure form at the time of “first substantive contact” with the prospective client. New York State’s Real Property Law Section 443 was amended effective January 1, 2011 as a result of a bill signed into law by Governor David Paterson. The amendment provided for advance informed consent to dual agency and also added condos and co-ops to the definition of ‘residential real property’ as it relates to agency disclosure requirements. f. “Residential real property” means real property used or occupied, or intended to be used or occupied, wholly or partly, as the home or residence of one or more persons improved by (i) a one-to-four family dwelling or (ii) condominium or cooperative apartments but shall not refer to unimproved real property upon which such dwellings are to be constructed. 2. This section shall apply only to transactions involving residential real property. 3. a. A listing agent shall provide the disclosure form set forth in subdivision four of this section to a seller or landlord prior to entering into a listing agreement with the seller or landlord and shall obtain a signed acknowledgment from the seller or landlord, except as provided in paragraph e of this subdivision. b. A seller’s agent or landlord’s agent shall provide the disclosure form set forth in subdivision four of this section to a buyer , buyer’s agent, tenant or tenant’s agent at the time of the first substantive contact with the buyer or tenant and shall obtain a signed acknowledgement from the buyer or tenant, except as provided in paragraph e of this subdivision. c. A buyer’s agent or tenant’s agent shall provide the disclosure form to the buyer or tenant prior to entering into an agreement to act as the buyer’s agent or tenant’s agent and shall obtain a signed acknowledgment from the buyer or tenant, except as provided in paragraph e of this subdivision. A buyer’s agent or tenant’s agent shall provide the form to the seller, seller’s agent, landlord or landlord’s agent at the time of the first substantive contact with the seller or landlord and shall obtain a signed acknowledgment from the seller, landlord or the listing agent, except as provided in paragraph e of this subdivision. d. The agent shall provide to the buyer, seller, tenant or landlord a copy of the signed acknowledgment and shall maintain a copy of the signed acknowledgment for not less than three years. e. If the seller, buyer, landlord or tenant refuses to sign an acknowledgment of receipt pursuant to this subdivision, the agent shall set forth under oath or affirmation a written declaration of the facts of the refusal and shall maintain a copy of the declaration for not less than three years. f. A seller/landlord or buyer/tenant may provide advance informed consent to dual agency and dual agency with designated sales agents by indicating the same on the form set forth in subdivision four of this section. What does dual agent mean? What is a single real estate agent? What is real estate dual representation? Can a NYC real estate agent represent both buyer and seller? What is advanced informed consent to dual agency? A dual agent is a broker or salesperson who represents adverse parties (i.e. buyer and seller) in the same real estate transaction. Dual agency also arises in a situation where the buyer’s agent is associated with the same firm as that of the listing agent, even if the two salespeople or brokers do not know each other and/or work in different offices of the company. Single agency is the most common form of real estate representation whereby a broker or salesperson represents either a buyer or seller in a transaction. Both a buyer’s agent who solely represents a buyer and a listing agent who exclusively represents a seller are considered to be working in a ‘single agency’ capacity as single agents. A single agent owes his or her client the fiduciary duties of reasonable care, undivided loyalty, confidentiality, full disclosure, obedience and duty to account. A single real estate agent refers to a salesperson or broker who exclusively represents either the buyer or the seller in a New York real estate transaction. A dual real estate agent, on the other hand, represents both the buyer and seller on the same transaction. Note that a dual real estate agent is required to provide full and fair disclosure to both buyer and seller before being permitted to operate in the capacity of a dual agent. Real estate dual representation is another way of saying dual agency, which occurs when the same broker or salesperson simultaneously represents both the buyer and seller in a transaction. Prior to engaging in dual representation, a New York real estate salesperson or broker must obtain informed consent from both buyer and seller. A dual agent is a salesperson or broker who simultaneously represents both the seller and buyer on the same deal under a disclosed dual agency arrangement. A New York salesperson or broker is also considered a dual agent if he/she represents two parties in mutually dependent transactions, such as the sale of one property in order to fund the purchase of another property. Yes. A licensed real estate broker or salesperson in New York City may represent both the buyer and seller under a dual agency arrangement provided that he or she provides buyer and seller with full and fair, informed disclosure. A dual agent may also seek advanced informed consent to dual agency from both buyer and seller before dual agency actually arises. Advanced informed consent to dual agency occurs when a New York broker or salesperson seeks informed consent to dual agency from both buyer and seller prior to the occurrence of dual agency itself. In other words, a broker or salesperson may receive consent to dual agency before it actually occurs. Advanced informed consent to dual agency has been permitted in New York since January 1, 2011.